At the Television Critics Association Winter Press Tour, PBS announced new programs and initiatives launching in 2015 ; including a new American drama set during the Civil War. Plus, PBS announced it will add 20 hours of new content developed with the BBC. Big news! A new Civil War historical drama, shot in Virginia, will join the OETA/PBS Sunday night drama lineup. The first season of six episodes is slated for a winter 2016 premiere. Based on true stories, the new drama follows two volunteer nurses on opposite sides of the Civil War. Mary Phinney, a staunch New England abolitionist, and Emma Green, a willful young Confederate belle, collide at Mansion House, the Green family’s luxury hotel that has been taken over and transformed into a Union Army Hospital in Alexandria, Virginia, the longest-occupied Confederate city of the war. As the boundaries of medicine are being explored and expanded, the role of women is also broadening. Here, in the collision of a wartime medical drama and a family saga of conflicted loyalties and moral dilemmas, the series plays out a story of the highest stakes. Executive produced by Ridley Scott (Gladiator and The Good Wife), the new drama is set against the backdrop of doctors and female nurses valiantly struggling to save lives while facing their own trials and tribulations. Almost 40 years ago Captain Ross Poldark galloped across the TV screens of millions of PBS viewers, vexing villains and winning female hearts in one of MASTERPIECE’s earliest hit series, POLDARK. Now the gallant captain rides again, allowing a new generation to delight in the exploits of an unconventional romantic hero. Aidan Turner (The Hobbit) stars as Ross Poldark, a redcoat who returns to Cornwall after the American Revolutionary War to discover that his father is dead, his lands are ruined, and his true love is about to marry his first cousin. The new POLDARK airs in eight exciting episodes starting in June 2015 on MASTERPIECE on OETA/PBS. Watch a preview. WOLF HALL is six-hour television miniseries adapted from Hilary Mantel’s best-selling Booker Prize-winning novels. The television event presents an intimate and provocative portrait of Thomas Cromwell (Mark Rylance), the brilliant and enigmatic consigliere to King Henry VIII (Homeland’s Damian Lewis), as he maneuvers the corridors of power at the Tudor court. 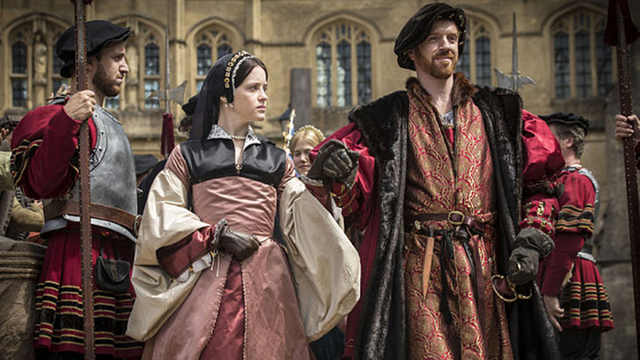 MASTERPIECE: WOLF HALL airs Sundays, April 5-May 10 at the special time of 8:55pm on OETA. Told from Cromwell’s perspective, the series follows the complex machinations and back room dealings of this pragmatic and accomplished power broker – from humble beginnings and with an enigmatic past – who must serve king and country while dealing with deadly political intrigue, Henry VIII’s tempestuous relationship with Anne Boleyn and the religious upheavals of the Protestant reformation. A historical drama for a modern audience, this unromanticized re-telling lifts the veil on the Tudor middle class and the internal struggles England faced on the brink of Reformation. At the center of it all is Cromwell, navigating the moral complexities that accompany the exercise of power, trapped between his desire to do what is right and his instinct to survive. ARTHUR & GEORGE, stars Martin Clunes (Doc Martin) as world-famous author Sir Arthur Conan Doyle, in a three-part adaptation of Julian Barnes’ acclaimed novel follows the separate but intersecting lives of two very different men: a half-Indian son of a vicar who is framed for a crime he may or may not have committed, and Doyle, who investigates the case. Premiere date TBD. PBS announced a new deal with BBC/BBC Worldwide to develop 8-10 new programming specials across approximately 20 hours a year, both stand-out singles and flagship multipart series, to air on PBS stations nationwide. Specials will begin airing as early as summer 2015. Unique in its breadth and scale, this partnership will deliver a pipeline of inspiring content across the full range of factual genres, including natural history, science, history, religion and the arts. These ambitious specials may be part of the PBS schedule or featured in ongoing PBS programming series, including NATURE, NOVA and GREAT PERFORMANCES. See more from PBS at TCA 2015: Day One. Day Two.